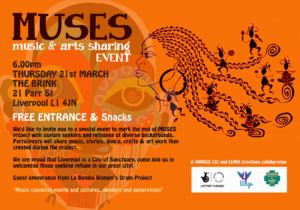 You are warmly invited to the launch of “Muses”. This event is the culmination of an arts project run at 4Wings by asylum seekers and refugees in Liverpool. All the details you need are in the flyer. This entry was posted in community, event and tagged arts, Liverpool by Mike Stoddart. Bookmark the permalink.